I didn't get a chance to start using Skritter yet but I will do in the next hour or so. I need to decide on what list to use. I am back to college next week, 2 evenings - 3 hours each way so its time to start doing a bit of revision today. Here are my textbooks along with a few Christmas presents I got for my self. 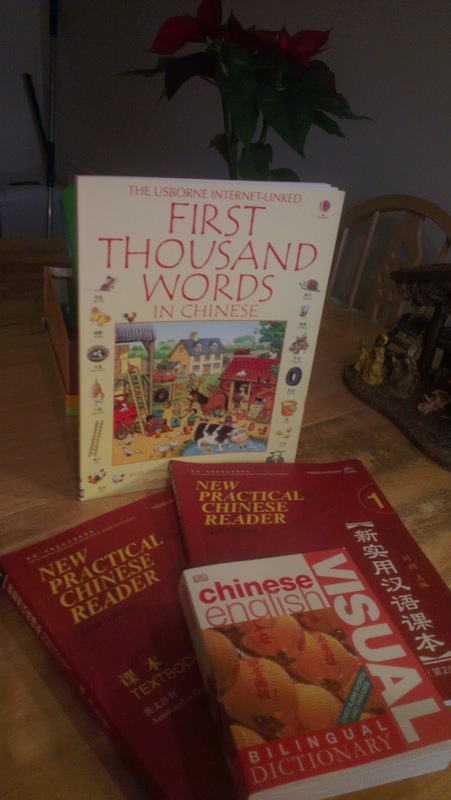 I'm toying with the idea of using the Usborne First Thousand Words in Chinese book and start with the first page and work from there. There's about 40 or so new words which roughly equate to about 80+ characters. Quite a lot in that alone, so I might use these as my character challenge. When I'm confident enough I will complete the next page and so on and so forth. There is about 55 pages of really nice pictures obviously done with children in mind but a great resource for beginners nonetheless. A certain realisation hit me of how little knowledge I actually possess when it comes to knowing words not to mention characters for everyday items i.e mirror, tap , toilet and so on. I think this book will be a good purchase and not to mention the great animations contained within.